Surprise, Cambodia has beautiful beaches! 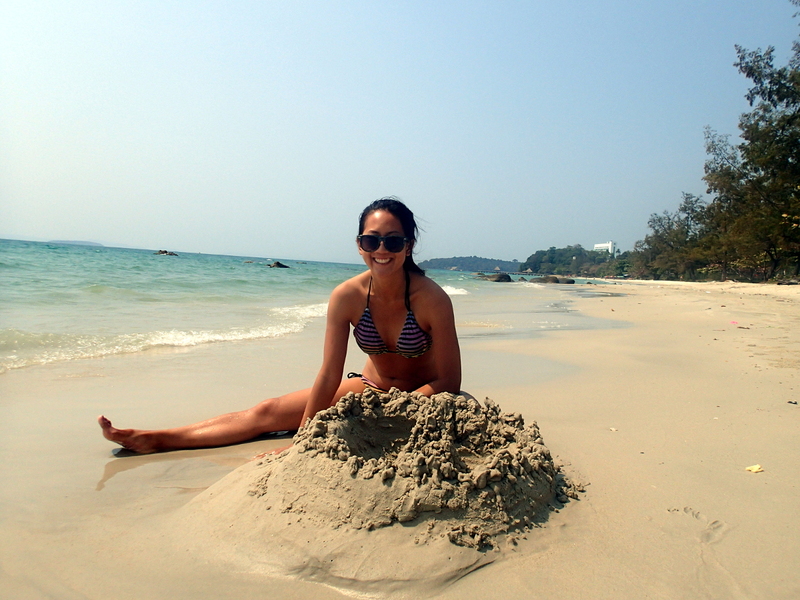 In my ignorance to what Cambodia has to offer, I was shocked to learn that Cambodia has beautiful, sandy beaches. 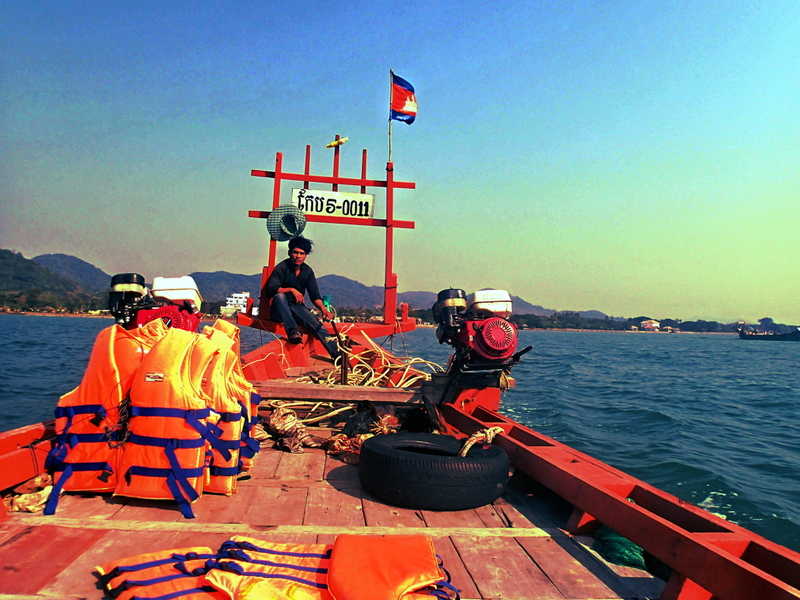 It was the weekend of Lunar (Chinese) New Year when we arrived to Kep. The entire beach area was crowded with locals, families and friends sitting on a large mat with an elaborate spread of food. Known for its green pepper crab, we enjoyed a plate with fresh grilled squid in the famous crab market. 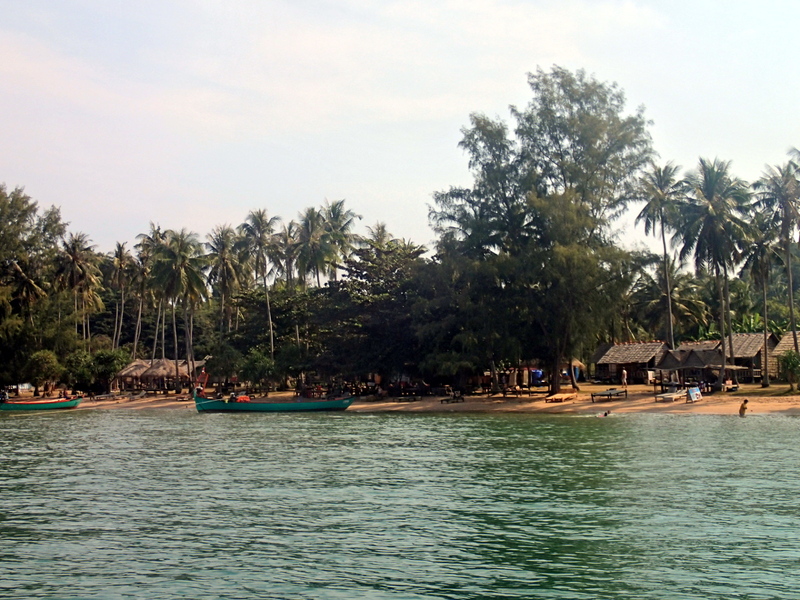 After the New Year’s rush, we retreated to Rabbit Island, a short boat ride away. The walk around the island only takes about two hours. We hung out under the shade, drinking a coconut and wading in shin-deep water. Generators are turned on for only 3 hours at night, so the rest of the night is pitch black, with only the stars and moon for light. Not meant to pass judgement, just a statement of fact – there is so much trash littered everywhere. What I imagine once to be a pristine beach but instead, I hesitate to swim in the water, nervous about a possible ear infection. Even in Rabbit Island, self-proclaimed up-and-coming beach getaway destination, is filled with Styrofoam and plastic bags. 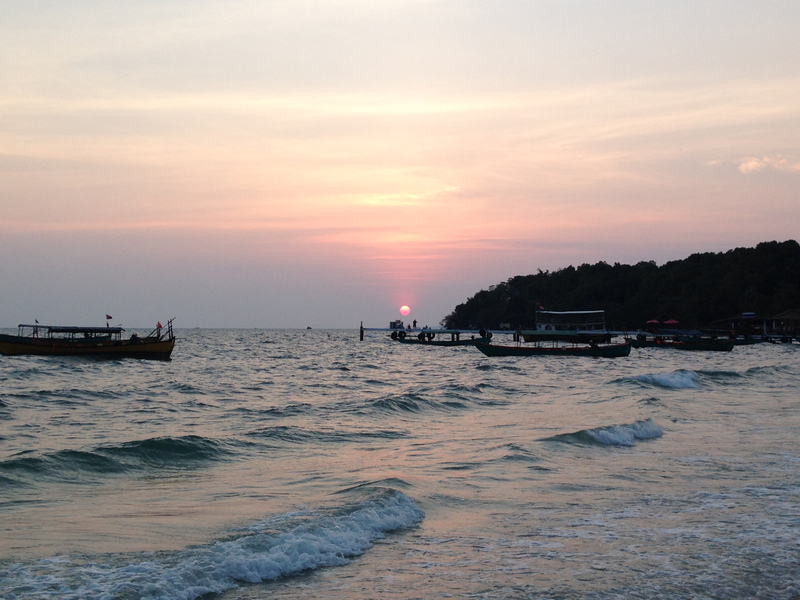 We did little research prior to our visit to Sihanoukville and ended up on the party section, Serendipity Beach. Restaurants each have tables set up in the sand, perfect for watching the sunset. 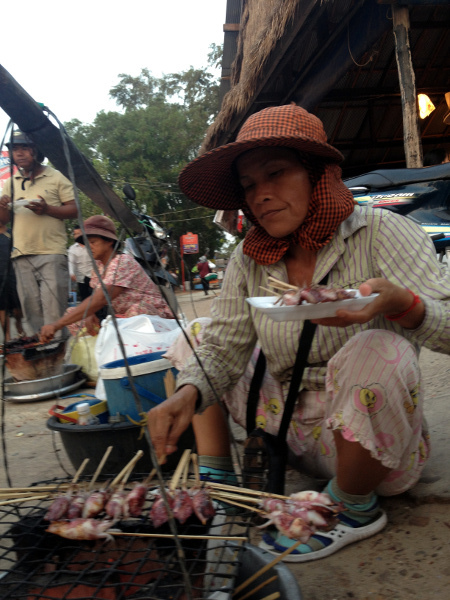 Older ladies haul heavy buckets of squid and a grill, using a beam to balance the load on their shoulders. Fifty-cent Roman Candles and $1 fireworks are bestsellers as drunkies return from the booze cruises and fill up on buy-one-get-one drink specials. My only birthday wish was to sleep in before exploring the 5km of beach on either side of our guesthouse. There were a few undeveloped beaches, perfect for swimming. Our favorite developed area was Ostres Beach. Given another visit (with a bigger budget), we would undoubtedly enjoy staying a few more days here. We spent the better part of the day swimming, as small fish would nibble on our ribs, and napping in the shade. 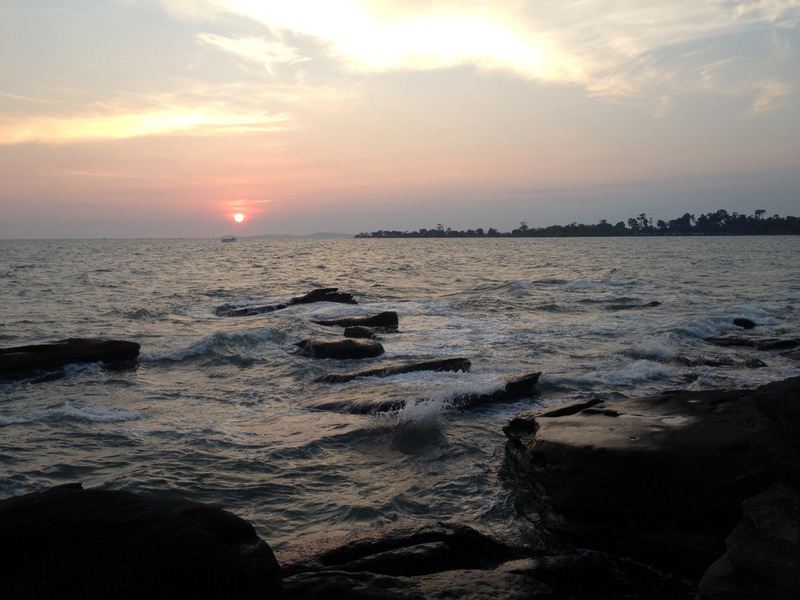 Many of the beaches are separated by rock outcrops, perfect spots to view sunset. The sun here is a warm, deep red, I had to fight my urge to stare directly into the light. I’d say that is a important thing to have.